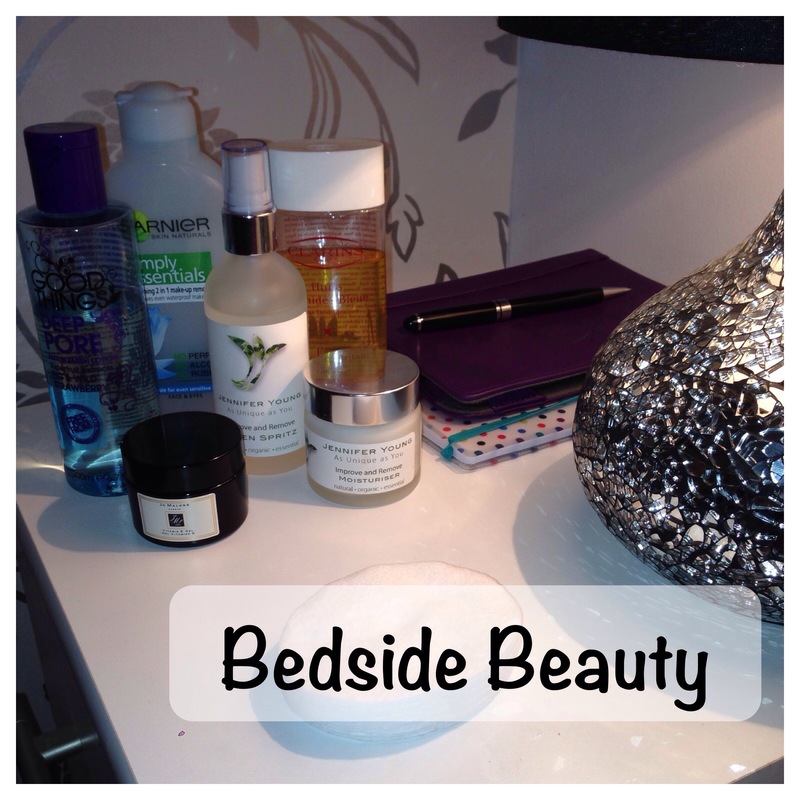 Bedside Beauty – The Beauty Spot. I’ll never admit to being the most religious about taking my makeup off, but in the last 3 months I really have tried to be. I have seen the light people! I have started using a cleansing balm! I love to use it after my face wash to thoroughly remove any nasties still left on my skin, so that when I flop into bed the ‘treatment’ part of my routine is much easier and feels divine because my skin is so soft and nourished from a good deep cleanse. If I have been wearing a waterproof mascara I will use my Garnier Soothing 2 in 1 Eye Makeup Remover to gently melt away the pesky stuff. I’ve found that this is a pretty good dupe for the Clarins Instant Eye Makeup Remover, winner! This also comes in handy if I’m having a lazy evening because I can at least remove makeup and give a basic cleanse sat in my bed! I have a few Micellar and water based cleansers in my bedside drawer but the Good Things Deep Pore water based cleanser has been the one I’ve reached for most often recently. I treat it like a toner mainly, just to make sure all of my makeup has been removed and also to the remove the last little bits of my cleansing balm. It works as a cleanser on its own as well, but it doesn’t give quite such a deep cleanse as the balm and wash I use. 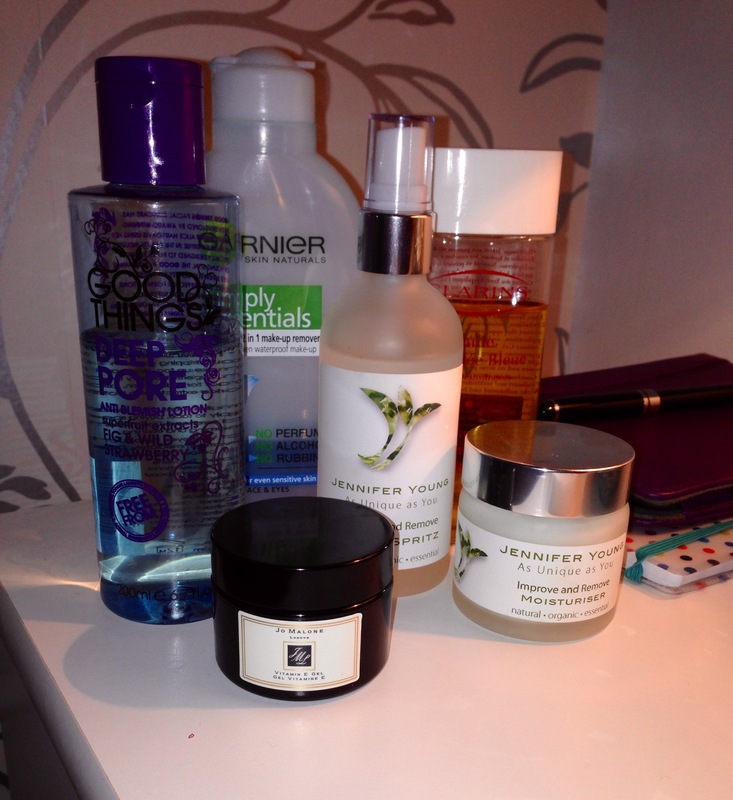 I’ve then got three products that I switch around as my night treatments. I mix my Jo Malone London Vitamin E Gel with Clarins Blue Orchid Face Treatment Oil for a super rich and intensive treatment. The Vitamin E gel works on the redness in my skin but also contains antioxidants to really treat my skin overnight. I’m not a huge fan of the smell of this, which is why I add the Clarins Oil. The scent really relaxes me but it’s also treating the dehydration in my skin. The other item I’ve been trying out is the Jennifer Young Improve and Remove Moisturiser*. This range is beautiful and is created for people going through cancer treatment, or anyone concerned with using harsh chemicals on their skin. I will go a little more in depth in another post I have planned soon, but safe to say the organic ingredients are beautifully blended and feel wonderful on the skin. I sometimes use this during the day, but it’s mainly used at night, especially if I prefer a less oily finish on my skin to go to bed with. Finally I give my pillow a quick spritz of the Jennifer Young Linen Spritz. This again smells beautiful and definitely aids restful sleep. It literally contains 3 ingredients so you know it won’t interfere with what has just been applied to your skin. No counting sheep for me! 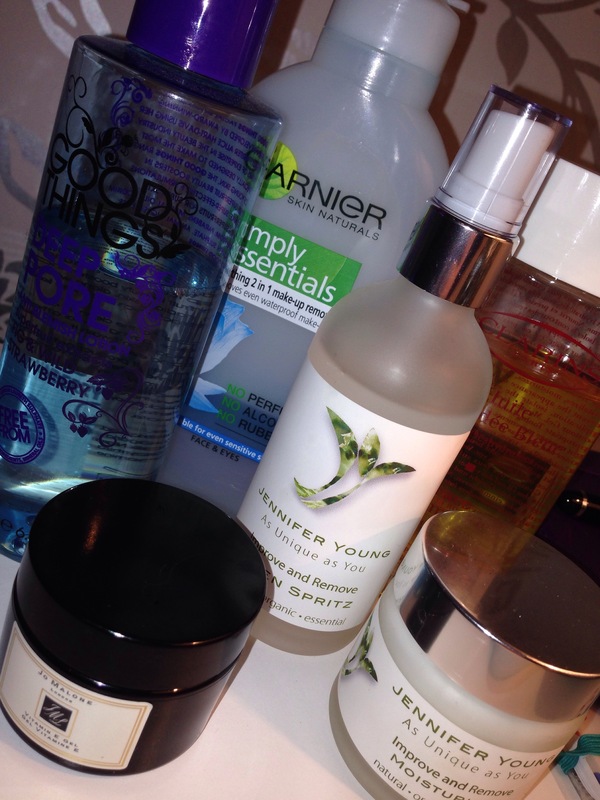 How different are your AM/PM skincare routines? What’s your most favourite skincare item? Thanks for reading, don’t forget to leave me a comment and follow my blog. I need to start clenseing a treating my skin a bit more before bed, I am normally so busy its whipped off quickly and into bed! I know, I was always the same! I’ve been trying so hard! I have to say my skin does feel better in the morning! I’ve also started taking my makeup off as soon as I’m home from work so all the stuff I use sinks into my skin and treats it more effectively! Love that you highlighted the “bedside” routine! I may follow suit! I would love to try the Good Things Deep Pore lotion in the future. Yes bedside was key for me! Sometimes I’m just too lazy or it’s too late so that’s perfect for me!